FRANKLY, THE TR ISN'T A CAR WE tend to think about all that often.Your average British enthusiast is so busy getting in and out of line for his Honda, his Spitfire, his MGB/GT or his Elan between friendly chats with his insurance broker that the really big dollar-earners-the Austin Healey 3000s, the E-types, the Tigers and, yes, theTRs go largely unnoticed. But not any more. STI have endowed the new TR5 with so much sheer poke that it's impossible to ignore it. for better or for worse like we used to . . . When we visited the engineering department in Coventry just over a year ago on one of our annual Motor Show pilgrimages, development chief John Lloyd showed us with pride the white 2000 saloon he'd been entering in club and national races as a full works effort. It struck us then that the purpose must have been scientific, since the car had attracted even less publicity than the much less way-out STI rally machines, and sure enough when we looked closer it became plainly apparent that almost the only thing standard about the beast was the fact that it had four wheels. The fact that it was inspired by but not developed from a racing family saloon is just one paradox in the story of this very potent new sports car. Another is that. 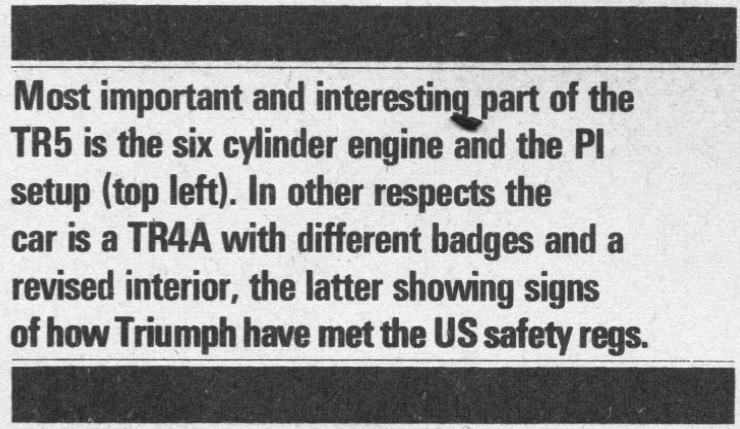 whereas John Lloyd and his master Harry Webster both admit freely that fuel injection is the long-term answer to their current search for a compromise between performance and the American anti-emission regulations, the one place the TR5 will not be sold initially is in the USA. (Instead. 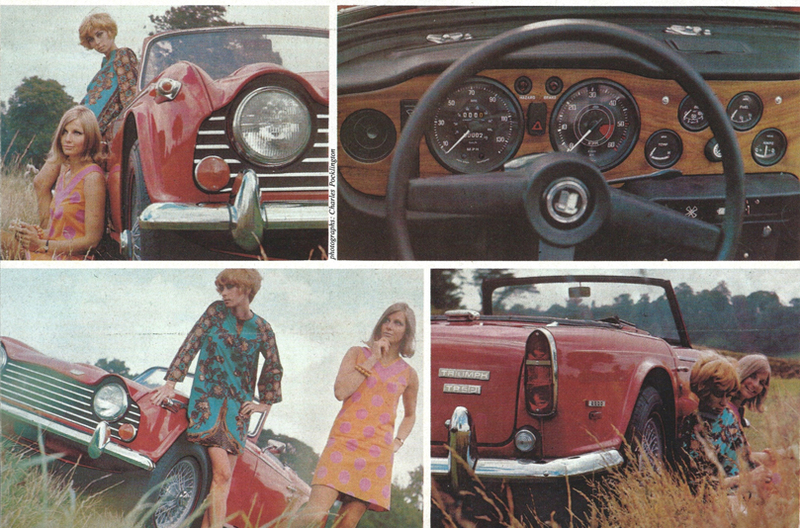 Americans will get a much less 'powerful version called the TR250 using a new and remarkably smog-free Stromberg CD carburettor. Why go to such pains to get more urge for any other market? Because of the French, apparently, and the Germans-both of whom love TRs dearly and are hungry for extra power. In fact it seems that the latter provided the necessary extra impetus for this fuel injected version, as STl's distributor there also handles Peugeot and has not been slow to notice the boost imparted to sales since Mercedes began plugging injection as a prestige option and Peugeot followed suit at a much lower price. with the successful 404 KF 2. By a vicious coincidence, the whole STI factory had seized solid the day we arrived to try the TR5 because of a piecework dispute arising from Lucas's sudden decision that the injection pump wouldn't work in hotter climes than ours unless it were tucked away in the boot. The hack prototype that we tried still had its pump under the bonnet. but the general chat led us to enquire what happened if something did go wrong and the average Joe asked his local agent to fix it. John Lloyd's answer, paraphrased, was that the Lucas Mark 11 PI system is the cheapest and simplest of all the types they considered, that it uses a simple rotary metering device no more complicated than an electrical distributor, that carburettor-type butterflies with a single cable control replace the racing system's slides in the flexibly mounted manifold, that the pump is little different from any other pump and is incredibly flexibly mounted to guard it from vibration anyway, and that the injectors themselves screw in and out and can be thrown away in the best Joe Lucas advertising tradition with no more trepidation than one wastes on the average sparking plug. This does not get round the fact that PI costs much, much more than the average carburettor setup and that we are not yet t the stage of throwing away even a twin SU without strong second thoughts. We can't help foreseeing big bills and protracted quarrels when the first injection systems start to play up. In common usage application. but in the meantime there are distinct advantages to be had. First. of course, comes power. This sort of injection is no magic tuning formula but it does mean that the engineers can go for much wildercam profiles without endangering flexibility, and that they can plan for higher compression ratios and richer mixtures without sabotaging economy. The result. 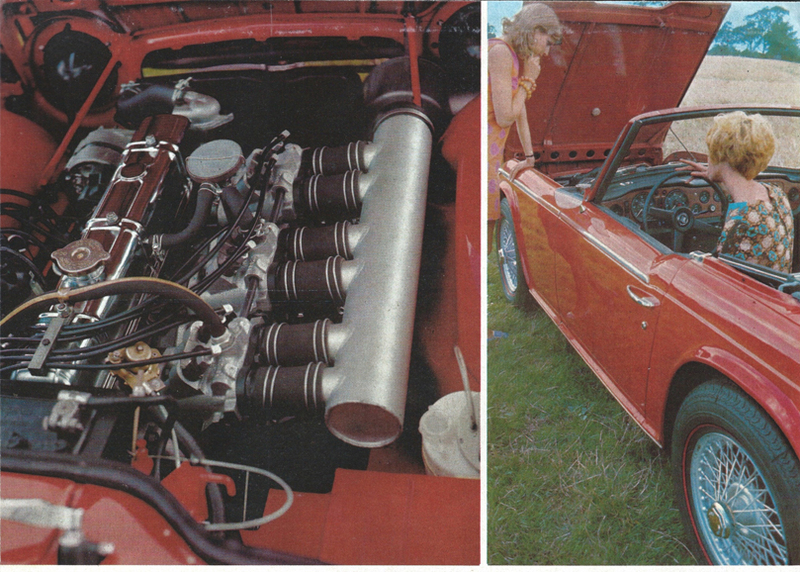 as Lloyd freely admits, is that the TR5 can be sold for everyday use in far crisper tune than could be achieved on anything short of three twin-choke Webers (costing still more) and yet offer increased flexibil ity and ICMI speed torque over the old four cylinder model as a sales advantage. The second advantage, of course, is economy, enhanced by this very flexibility which means that more of the power is available throughout the acceleration process and that times are vastly improved in consequence without excessive gearchanging. And the third point is that the very fact of PI is a sales advantage in itself; people like to think they are buying engineering efficiency (as Honda with their four carbs and twin cams have proved) and to be able to show off a bonnetful of expensive looking machinery is the perfect answer to neighbours who scoff that the TR is just a 2000 with a bit more air in the cylinders and tWo of the seats chopped off. On the road, it certainly feels unique among affordable British sports cars. We will not recap on the TR itself; and it is well known as a bit of a bitzer, with 2000 semi-trailing irs and a Michelotti body grafted onto an ancient frame, and in its current form the only real differences are (a) that the new 2.5litre engine puts about 251b more weight on the front wheels and (b) that the tyres are crossplies as standard-either Michelin XAs or Goodyear G800, the former chosen (and fitted to our cad because of their excellent high-speed stability and long life and despite a continuing reputation for odd though improved behaviour in conditions of heavy rain. The car's compromise origins show up in a rather remote driving position which leaves one sitting high and looking down on the undulating bonnet. with precious little upward visibility and no spare elbow room, but the new wheel feels good and the control layout is much better with piano type switches grouped on a matt wooden dash instead of scattered all over the central support. Three things strike you as you start the engine: it is very smooth, very quiet for a sports car unit. and extremely responsive. Out in the open it is all go. The power arrives even before the rev counter gets to 1500rpm, and by the time it reaches 3000 you are already busy. From there until the red line at 5500 (set. we gather, simply because the curve tails off at that point and not. because the engine is about to blow) there is a constant blast that provides vivid acceleration in all of the rather widely spaced gears. We were about to complain that second felt far too low when the development boffin pointed out that overdrive (an essential extra at (59) still operates in that gear just as it used to in the very first TRs, adding picturesquely that it was 'good for one Castle' meaning 70mph. From that point we began to enjoy ourselves, playing tunes on what is in effect a seven-speed gearbox and really rocketing round the crowded Warwickshire lanes to such effect that we were barely established in one ratio before it was time to swap to the next. Top speed? Well. they're looking for 115 or even 120 but a jury-rigged exhaust system was robbing our car of perhaps five or six bhp and the needle stopped dead at 110 with the car beginning to snake just a trifle in a stiffish crosswind. All of this time the only noise, apart from a bit of gearbox whine and the sound of the wind in the rigging, was a remote, muffled intake roar from the engine that some how matched the very masculine mood of the machine as a whole. Cornering power, despite the power oversteer, is undoubtedly high and if you can accept the rather ragged progress that is more or less forced upon you the TR in skilled hands ought to be capable of some very rapid journey times on British roads. Unlike the smaller-engined GT6, its design does not conceal any obvious traps for young players and although it is no Lotus when it comes to finesse we can think of much less exciting ways to spend the odd £1212.